Gloom in game: 891 Who? Important notice! Pokemon Gloom is a fictional character of humans. 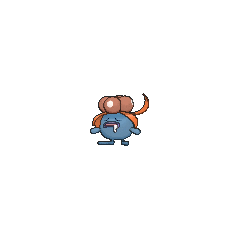 Gloom is a blue, bipedal Pokémon with rudimentary hands and feet. It has orange leaves and a reddish-brown flower growing from its head. The flower has large, rounded petals and white spots. The female displays only a single large spot on each petal, while the male will have more, smaller spots. Its eyes are wide and often appear closed and its lips are thin and purple. 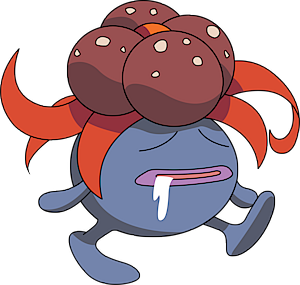 Gloom trickles sticky nectar from its mouth with the appearance and consistency of drool. This can be used as a fertilizer for plants. Both this nectar and the flower on Gloom's head release a foul odor strong enough to induce fainting in humans over a mile away. However, it can also attract prey, and even a very small number of humans find it pleasing. This odor is a key ingredient for some perfume production. When it is in danger, the odor worsens, but it will not emit its odor if it feels safe. Gloom lives in grassy plains. In the past, Petal Dance was its signature move. Erika, the Gym Leader of Celadon City, has a Gloom that Ash Ketchum rescued from the Gym when it went up in flames because of Team Rocket. Erika first met Gloom when it saved her from a Grimer when she was a girl. 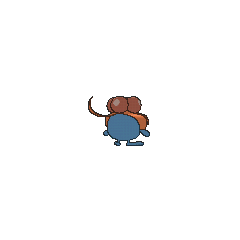 It appeared in Pokémon Scent-sation!. According to this episode, Gloom is a very useful Pokémon. Erika uses Gloom's stench as a recipe for composing perfume. 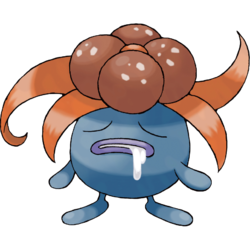 Florinda has a Gloom which she wanted to evolve into a Vileplume in Make Room for Gloom. However, Florinda decided it didn't need to evolve after it beat Team Rocket with its powerful SolarBeam attack. It reappeared in a flashback in Bulbasaur... the Ambassador!. A Gloom was also used by Gulzar in Pokémon Food Fight!. Multiple Gloom were among the feuding Pokémon at Professor Oak's Laboratory in Bulbasaur... the Ambassador!. 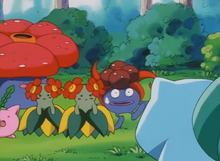 Multiple Gloom appeared in Whichever Way the Wind Blows where many of them either evolved into Bellossom or Vileplume depending on the direction of the wind which contained fragments of Sun Stones and Leaf Stones. Multiple Gloom appeared in Bucking the Treasure Trend! where they attacked Ash and his friends. Multiple Gloom were among the Pokémon seen at Professor Oak's Laboratory in Showdown at the Po-ké Corral. A Gloom under the ownership of a Trainer competing in the Indigo Plateau Conference appeared in Round One - Begin!. A Gloom was one of the Pokémon stolen by Butch and Cassidy in The Fortune Hunters. A Gloom belonging to a Trainer appeared at the Pokémon Jujitsu Academy in Ariados, Amigos. Two Gloom appeared in The Grass Route, one was seen in the wild and the other belonged to a Trainer participating in the Grass Tournament. A Gloom was seen being fed by Tracey at Professor Oak's Laboratory in Johto Photo Finish. A Gloom appeared in Pinch Healing!. A Coordinator's Gloom appeared in Once More With Reeling! participating in the Terracotta Contest. 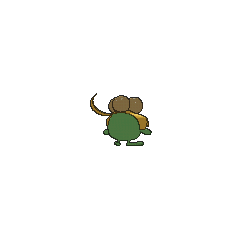 A wild Gloom appeared in The Grass-Type Is Always Greener!, found by Cheryl's Mothim while searching for the Enchanted Honey. Gardenia tried to capture it, but it managed to run away. A wild Gloom appeared in Pokémon Ranger and the Kidnapped Riolu! Part One. Gloom also appeared in The Power of One, Destiny Deoxys, and Arceus and the Jewel of Life. A girl's Gloom appeared in League Unleashed!. An image of a Gloom appeared in A Performance Pop Quiz!. EP107 Gloom Ash's Pokédex Gloom, the Weed Pokémon. Gloom gives off a very unpleasant smell. While strong against Water Pokémon, Gloom is weak against Fire and Flying types. DP031 Gloom Gardenia Gloom, the Weed Pokémon. It gives off a powerful aroma that can cause those to smell it to faint from two milesaway. In Pokémon Adventures, Gloom's most notable appearance is under the ownership of Erika as part of her Gym team, as with itsevolutions, but it isn't shown battling. It first appeared in Paras Sight. A Gloom appeared in The Last Battle XIII as one of the Pokémon sent to help the fight in Ilex Forest.